The F&B industry of Guwahati has grown by leaps and bounds over the last few years. Compared to the deplorable state of affairs of the F&B industry in the city a few years back, Guwahatians now have a wide range of exotic cuisine to choose from, owing toa plethora of restaurants that have opened up in different localities of the gateway city, offering Guwahatiansa wide range of eclectic cuisines to choose from. Among the new crop of restaurants that have come up in the city, Ziyahas established itself as one of the foremost eateries for European and continental food in the city. This place, which first started operations in a small place in Zoo Road Tiniali, has the distinction of being one of the first restaurants to serve European-themed cuisines for the first time in the city. Although it met with a favourable response right from its inception, over the last couple of years it has shifted to Guwahati Club, above the Hyundai showroom, to widen its clientele base. The new restaurant in Guwahati Club, which is posh and elegantly decorated, is already attracting hordes of food lovers. So, if you are looking for your favourite dose of European and continental food, Ziya should definitely be in your must-visit list. While Ziya was initially launched as a restaurant specialising in European and continental food, after it shifted to Guwahati Club, it has now expanded its menu to also include a mouth-watering range of Indian, Mughlai and Tandoori items, apart from its regular fare of continental and European food. This multi-cuisine restaurant is presently trending across the foodscape of the city, owing to its excellent range of multi-cuisine food items in an upscale environment, where the sole focus is on quality food served in a hygienic and cosy environment. Coming to the interiors of the place, the restaurant boasts of a pretty sober ambience, with the emphasis being solely on serving quality food in a comfortable and cosy environment. Since it is located on the first floor of the building housing the Hyundai showroom, it offers a good aerial view of the roads and junctions of Guwahati Club. The interiors are made up of comfortable chairs and tables, with very less emphasis on the decors which have been kept minimalistic. The lightings and sober colours sets the perfect mood for a quiet and relaxing dining experience for you and your loved ones. The service staff members are pretty efficient and well-mannered. Armed with a thorough knowledge of the menu, they help the customers select the best dish to suit their diverse taste buds. The service is pretty fast and leaves no rooms for complaints. 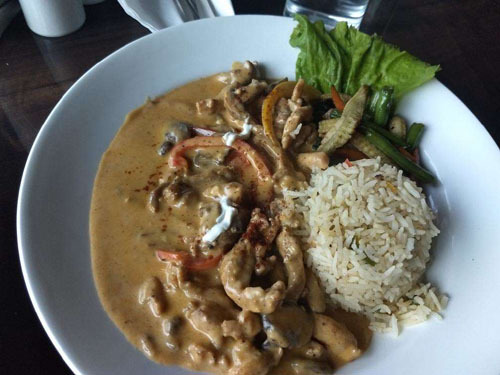 Coming to the food, Ziya’s emphasis is on serving European cuisine but in recent times, it has also started serving Indian dishes to cater to its growing clientele. As it was initially conceived, the Pork Steak and Roasted Pork Belly with mushroom and Bacon sauce are still some of the most popular items in the menu, and are an absolute delight for pork lovers. The pork meat served here is tender, fatty, juicy and creamy which makes it one of the most sought after items in the menu. Coming to the pricing of the food items, the management has kept the prices on the slightly higher side. A normal meal for two in Ziya will cost you around Rs 700 for two persons. So next time you are looking for a multi-cuisine restaurant in the heart of the city, do give Ziya a try!We are sure you won’t be disappointed!